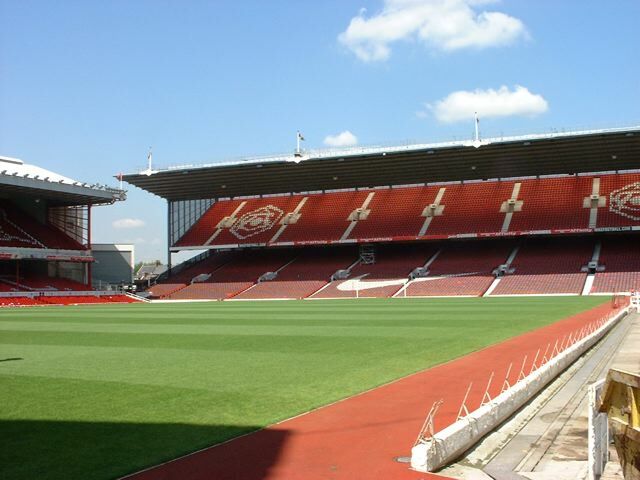 Highbury when it is not raining. Arsenal was playing Lazio on September 27, 2000 in a driving rain and a match which everyone expected Arsenal to lose. Lazio came in not being the group favorite, but the overall favorite to win the Champions League that season. Arsenal, despite winning every game up to that point, was still looked at as suspect in European play. I got my tickets from a ticket broker (first, and last time I’ll ever do that). My overpriced, semi-obstructed view seats ended up on the East Bank lower, which has the ambience of watching a football game in someone’s basement that is about a foot too short for most humans. Still it was Highbury and I was happy to be there. My wife/girlfriend was not. On top of the rather long flight, change in time zones, and climate differences between HK and London, she was repeatedly warned by her colleagues “English Football is Dangerous!” Hooligan stories wafted through her head most of the flight, and she was actually afraid we would get beaten up. As we walked up the rather long ramp from the Arsenal station, we emerged into the London mist in front of six police horses in riot gear. Armored plates on their legs, plexiglass covers over the animal’s eyes, and a helmeted rider with a club and shield. She glanced over to me with a “thanks-for-taking-me-to-my-death” look that haunts my nightmares to this day. “It’ll get better” I told her. Walking around Highbury is something I recommend to anyone who hasn’t been to the home of football. Not only the sights, the colors, the noise, but the smells are something that will stay with you for a long time to come. We moved down the rows of vendors, carefully looking at the shirts and programs and sweets for something worth buying. “Let’s get something to eat” I broached to her, turning the corner on Avenell road and heading to the main entrance. I could smell something burning, not quite meat, not quite vegetable, more along the lines of burning dog hair. I headed up to the trailer housing men speaking a strange language (Turkish? Arabic? Welsh?) and ordered two “meat patties” for dinner. When the grey matter arrived on the bun, my wife and I stared at debating who would be first to die. Eventually I took one bite, spitting it out as the grease ran down my throat. “Let’s get something inside” she said chucking hers into the trash. I pushed my way through the cellblock-like structure that is the Arsenal turnstyle, and had to help my wife (who is a bit weaker) enter the grounds. As we got through, I heard the name “Tony Adams” receive a loud cheer as it was announced on the public address that he would be playing following a long bout of injury. As the clock ticked down seats opened up in the lower rows and my wife and I moved down from under the cover of the East Deck Upper (the lower deck is “roofed” by the upper deck, keeping you dry but ruining your view, sort of). We got down to field level where we took a couple pictures and enjoyed the final whistle in the misting rain. I’ve honestly lost track of how many times I’ve been to Highbury since that day, although my wife has not made it back since that night (fricking US INS–long story). I still delight in wandering the streets before the game, taking in the smells and buying too many sweets.